May 24, 2013 – Will Expensive Wool be Itchy? This was a term someone typed into Google and was directed to my blog so I thought the least I could do is try to answer. Put simply, the price you pay for wool does not determine the “itch” factor. You can pay a fortune for a gorgeous, yet incredibly scratchy jumper which is not meant to be worn next to your skin but will keep you toasty warm in anything the British weather will throw at you. You can also pay quite modest amounts for 21 micron Merino jumpers which you CAN wear next to your skin. Making an informed choice is NOT easy and for many people, it’s a step too far. Why bother to try to find out about wool when you can reach for synthetic in the shape of the ubiquitous fleece? The answer has to be that wool is INFINITELY superior, more flexible in use, more environmentally friendly and will give you an immense feeling of smug superiority every time you wear it. It’s well worth the effort of finding out about. February 23, 2012 – Why does Wool Itch? The comfort of wool clothing, particularly when worn close to the skin, is a crucial factor when we consider buying garments. A poor experience with “scratchy” wool can put us off for life! But exactly WHAT makes some wool feel this way and how can we find wool that definitely doesn’t have the itch factor? Itch or ‘prickle’, occurs when the ends of some wool fibres push against the wearer’s skin, resulting in nerve endings in the skin being stimulated. This can cause skin irritation and scratching which leads to the release of histamines in your skin, inflammation and yet more itch, scratch etc! Many people who experience this think they have an allergy to wool but it is extremely rare for anyone to suffer a true allergic reaction to wool. This should be verified by a doctor. Most people are feeling a normal physical reaction to specific coarse fibres poking their skin. 1.The thickness or diameter of the wool fibres in the garment. In general, 30 microns is the cut off point. Below that individual fibres are not detectable by human skin. Average British wool ranges between 32 and 37 microns. Lambs wools will be finer but not necessarily fine enough since the proportion of 30+ fibres might still be quite high. Most British wool goes for carpets and that which does go into clothing, unless sourced from specific finer woolled breeds, is best suited to outerwear or heavier jumpers etc which don’t touch your skin. 2.The yarn/fabric construction and finish. Woollen spun or Worsted spun yarn for example where worsted will produce a flatter, smoother yarn and ensure that any coarser fibres are lying flat and not sticking out to dig into the skin. So how do we choose a non-itchy jumper? Finer, thinner wool fibres bend more easily than thicker fibres. Instead of pushing against the skin, they simply bend and buckle when the fibre comes in contact with skin. So finer is definitely better if you want to avoid the itch. The more fibres sticking out, the more likely the fabric will cause discomfort. The length of protruding fibres also affects comfort. Longer fibres have more opportunity to bend when pressed against skin, whereas shorter fibres are more likely to push into the skin causing an itchy sensation. So, to avoid the itch when wearing wool that comes into contact with skin, go for garments containing guaranteed fine wool of less than 30 microns and with a minimum fibre length of…? What? How are you as a shopper meant to find all this out when it’s not shown on a label? Will a shop assistant know? Not likely!! The best and safest way is, as usual, to buy the very best quality you can afford. Obviously buy Merino for guaranteed fineness, but remember that NOT ALL wool sold as Merino is particularly fine and nor is it well spun and knitted so you can still get prickle and itch even with the name Merino on a label. A good Merino (or Bowmont!) will have a Prickle Factor (actually called Comfort Factor) of 95-99% meaning that 99% of fibres are less than 30 microns. Cashmere of course is 100% by contrast. My finest Bowmont is 99.8%. A cracking good sheep!! Quality Quality Quality is key. Buy a really good, expensive well known knitwear brand (pref British!) and rely on them to know the technicalities. They will have sourced the fine wool with the right fibre length to have spun and knitted into their garments and should certainly be pleased and able to answer any questions you ask if you get in touch with their customer service depts. Pringle, Johnstones of Elgin, Smedleys etc are obvious choices. Yes of course these are very expensive but we really should, as Vivienne Westwood said at London Fashion Week this week, “Buy Less, Choose Well, Make It Last”. WOVEMBER: I often hear the complaint that wool is itchy and in the past was known to mutter these words myself (although now I am a fan of all wool, including the really coarse stuff!). Understanding breed types, applications, garment construction etc. I now understand that this widespread, blanket statement belief is being particularly damaging to the health of the wool industry. I love the work you do to explain why some wool is itchy, but there are quite a few photos of you presenting handfuls of Bowmont Fibre to the public, and I think this a wonderfully direct way of showing people just how fine and soft wool can be. 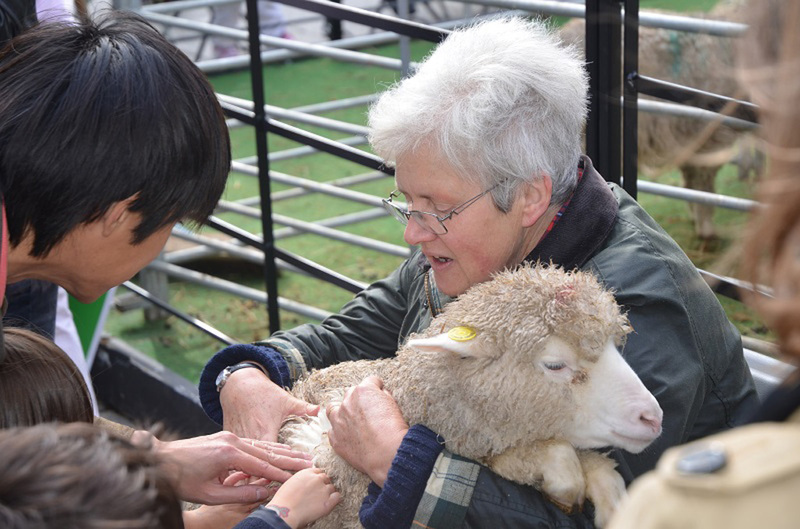 I wondered if you could tell us a bit about the sorts of conversations that bringing fibre and sheep into public view creates, and some of the best responses you’ve had to this wonderful outreach work? Lesley: Mostly is just what you say. People often comment “I can’t wear wool I’m allergic!”. When you question that more deeply what they ACTUALLY mean is that wool itches them, they scratch, the skin goes red, they scratch some more etc and then they think they have an allergy. True wool allergy is incredibly rare. Most people would be very uncomfortable and itch in above 30 micron wool next to the skin. But when you explain how wearing the RIGHT wool next to your skin can be amazing in heat and cold they are fascinated. I wear a lot of Merino T shirts in bright colours and people are astonished when they feel them. Thank you, Lesley, for helping us to understand why some WOOL is itchy and why some WOOL is not!